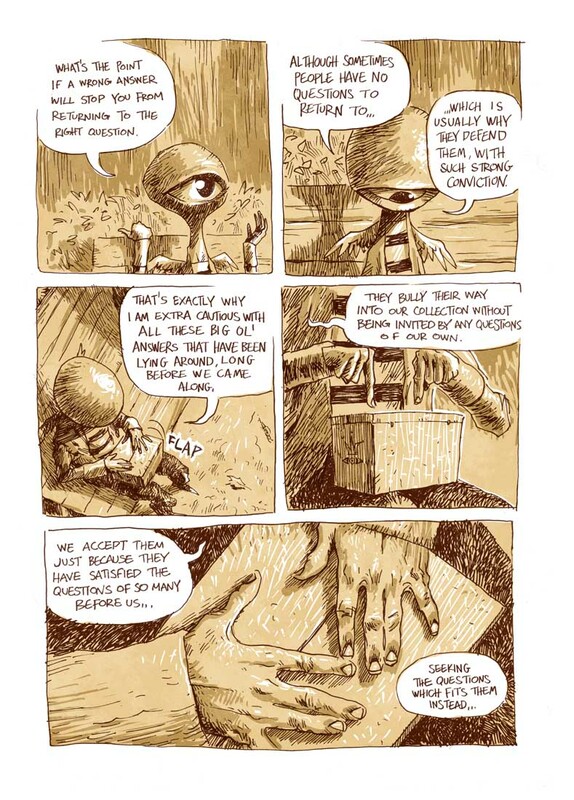 I had a surreal experience reading this profound comics strip. A surreal, strange, but beautiful walk in the park where you catch a glimpse of that elusive, important thought, chase after it, and then stumble upon a secret place instead. Beware of big old answers be it in business, education, politics, religion, or culture. Even better than the Big Idea, let’s ask out loud : What’s the Big Question? We need a curriculum of big and beautiful questions. Many people, including me, have to unlearn to think of the answers first. Solutions are, of course important, but the way we frame questions will influence the kind of answers we get. “What’s the point if a wrong answer will stop you from returning to the right question. Although sometimes people have no questions to return to…which is usually why they defend them with such strong conviction. That’s why I am extra cautious with all these big ol’ answers lying around, long before we came along. They bully their way into our collection without being invited by any questions of our own.